Influence is the capacity to have an effect on the character, development, and behavior of someone or something. As I reflect on the nature of influence, I think about those in civil government. They undoubtedly have an effect on the lives of everyone living in a country or nation, which brings us to the age-old problem... How does a “nobody” reach a “somebody” and affect them for change? Obviously, in the land of America, there is the effect of the ballot box, or voting. This seems to be the way that most Christians have engaged in influencing their government for decades. Does this have an effect? Certainly. However, what is the most important effect or change that can be wrought in a nation, a country, a government, and its leaders? When believers sincerely consider this, it is the effect of the gospel of Jesus Christ. I call this, “gospel-centered influence.” The following account illustrates this point. I had been ministering in the capitol merely a few months when a legislator came to me about a great moral issue of the day that was pressing on him. He remarked, “You’re a pastor. I want to know what your opinion is and what the Bible says on this particular issue.” I responded that my opinion didn’t matter, but what the Bible said was paramount. As we spoke, I determined not to lobby him to vote a certain way. He was disinclined to vote for a Biblical position on the matter, and I didn’t need to attempt to “win” his vote. However, many times, a moral issue is simply a sin issue, and that was the case here. So, for the next hour and a half we talked about sin, how we are all in the sinking boat of sin, and how the only way out of this sinking ship is the lifeboat of Jesus Christ. I didn’t ask him how he was going to vote. That didn’t really matter. I was more concerned for his soul. Although he didn’t pray with me to accept Christ at that moment, the seeds of truth that God had allowed me to share worked a miracle in his heart that I later found out about. Several days after this, I watched in surprise as this legislator voted for the Biblical side of the issue. Reporters gathered around him to ask why he had voted that way, and he responded that he had become a Christian. He began attending rallies for the same cause that he had previously been against. His entire perspective had changed because of the gospel. As he was going around promoting these new principles, he actually shared how a young man at the capitol had told him about Jesus and about salvation and that he had become a Christian. This was the true miracle. Sadly, within a few months, this legislator passed away unexpectedly. This really drove home the point of emphasis to me, as to why I should pray for my leaders, and why I should influence them - NOT for the cause of issues or politics, but for the cause of the gospel. Every believer needs to be cautious as he enters the political arena. Let us never set issues or politics above the gospel. Let’s not make politics a stumbling block. The gospel of Jesus Christ is offensive enough to the non-believer. We don’t want to be moralists, encouraging morality instead of salvation. Christ does not say, “Live right, walk right, talk right and maybe I’ll accept you.” In fact on the cross, He says, “It is finished.” Jesus has done all that needs to be done for our salvation. How, then, do churches go about reaching government leaders with the cause of the gospel? This chapter will focus on three ways we can have gospel-centered influence on our leaders: prayer, practice and perception. So believer, how do you pray for those in authority? Thankfully the Lord has given us a list. 1 Timothy 2:1-4 lays out four ways we can pray for our leaders. Let’s discuss giving thanks first. Truly, prayer is not only about asking for what we desire. In fact, as we think of prayer and ultimately influencing the heart of God, giving thanks is one of the key elements. It is extremely difficult for the believer to thank God for leaders they don’t like or don’t agree with, yet it is a direct command to thank God for those in authority over us. This command wasn’t given to believers in a time of Christian prosperity, but rather in a time of dictatorship, tyranny, and persecution, and it still holds true today. We are required to give thanks for the leaders God has given us. Second is intercession. Intercessory prayer is praying on behalf of someone. This certainly should be the case for Christians. Our leaders may in fact, not know how to pray, so we stand in their place and lift them up. There is an old story that one of our retired legislators tells as true - A Democrat and a Republican were walking in the halls of the Statehouse. (Contrary to popular belief, Democrats and Republicans do talk to one another.) The Democrat turned to the Republican and said, “You Republicans wave the banner of Christianity and say that God is on your side...I would bet that you don’t even know the Lord’s Prayer!” The Republican was aghast and replied, “Of course I do!” The Democrat responded, “I bet you $20, that you cannot recite the Lord’s Prayer right now!” The Republican accepted the challenge, and in the halls of the capitol building, he quite piously and reverently bowed his head and commenced reciting the Lord’s Prayer. “Now I lay me down to sleep, I pray the Lord my soul to keep…” When he was finished, the Democrat looked at him and admitted, “I didn’t think you could do it,” and handed him the money. While this is a funny story, and not likely true, the fact is that while there are many leaders who are praying believers, there are numerous ones who do not know how to pray, and have not received the gift of Jesus. Thus the primary prayer for legislators does not concern legislation, but salvation. This is real intercession. Third is prayer. Prayer is petition. It’s much more than simply asking for what we want, though. Prayer is communication. It is the telephone line between us and God. We talk to Him and He responds through His Holy Spirit and the Word of God. Communicating through prayer centers us on what is truly important. When we pray for those in authority, we are actually giving a gift to them. Proverbs 18:16 says, “A man’s gift maketh room for him and bringeth him before great men.” As we think of influence, we naturally think of giving a gift. This is often done on a carnal level. “Mr. Worldy-wise” will tell you to gain influence by giving money and gifts and similar material wealth. Although we, as believers, shun bribery, there is a principle of gift-giving in Scripture that is healthy. If we want a seat at the table of influence, at the “city gates”, or at the city council meeting, for example, we have a far more powerful gift to give - the gospel. Again we want to influence them for the cause of the gospel, so the first thing we do is to take time out of our schedule to pray for them. This is a tremendous gift of time and effort, and this gift is providing prayer warriors around the world a seat at the table of influence. Last is Supplication. Supplication has the implication of begging or earnestly beseeching. As we think of begging God, certainly on behalf of our nation, we remember the example of Nehemiah who begged God to work on his nation’s behalf. How can churches actively practice praying for our leaders? We need to make it a part of our corporate worship as well as a part of our daily prayer lives. In Paul’s letter to Timothy (I Timothy 2:1) he urges us to pray for our leaders, “first of all”, implying that we are to make it a priority. Prayer for our leaders has been written in many of the rote prayers throughout church history. Our forefathers prayed for their leaders. It was a regular part of their worship. In contrast, many of the modern era churches do not encourage praying for our authorities. Yet it’s something that Paul asserts needs to be a priority. So make it a priority in your personal and corporate worship and prayer groups. Pray for those in authority, specifically those in civil government. Another practical piece that is often overlooked is to let your authorities know that you’re praying for them. Send them a note, an email, a Facebook Post, or call them and let them know you, your church, or your small group has been praying for them. You’ll be surprised at the impact this makes. Again, we’re talking about gospel-centered influence. As you pray for someone, God influences their heart. When you let them know you’re praying for them, you begin to have influence in their life because you’re communicating your care for them. When you begin communicating with your leaders, the next practical step will come naturally: Ask them how you can pray for them. This question will prompt many different responses from political leaders. If it’s someone you don’t know well yet, they may give you a general prayer request. However, as you persist in prayer, persist in letting them know, and persist in asking how you can pray for them, trust and influence will begin to build. The old maxim suggests, “People don’t care how much you know until they know how much you care.” So just continue to faithfully pray, regularly let them know you’re praying, and ask them how you can pray for them. The last practical step is to simply follow-up. Pray, let them know, ask how you can pray for them, and then follow-up on those prayer requests. Has there been resolution on that request? How is God working? Or maybe the situation is still on-going and you let them know you’re still praying for that particular prayer request. These four practical ways are simple but vital in building gospel-centered influence in the lives of leaders. The testimony of the believer is critical in changing the heart of leaders toward the Gospel. 1 Peter 2:17 encourages us in this, “Having your conversation honest among the Gentiles, that whereas they speak against you as evildoers, they may by your good works, which they shall behold, glorify God in the day of visitation.” This clearly indicates that our behavior and testimony should be such that others see our actions and are drawn to the Lord. Having ministered in the capitol building since 2004, I have unfortunately seen believers act in ways that aren’t Christlike. Near the beginning of our ministry, one legislator even told me that Christians could be some of the meanest-spirited people in the world, and I’ve regrettably seen emails that can attest to this fact. Here is a prime example. Several years ago, I was walking with a legislator through the Statehouse when two women came up to us and began to discuss a particular issue. They were quite passionate about this issue. They were dressed conservatively and appeared to be church ladies, but as they began to talk and get worked up about their cause, they sounded like anything but Christians. The legislator that was with me had to excuse himself to get to a meeting and that left me there to finish listening to the ladies. I was unable to get a word in edgewise as they continued with their vehement diatribe. They finally slowed down enough to ask me what legislative district I represented. I told them I was just the chaplain at the Statehouse. They were surprised and embarrassed as their language had become quite salty and derogatory the more fervent they became about their issue. I believe they realized too late that they had not been representing Christ in a way that was honoring to Him. I tell this story to remind us that as we attempt to influence those in power, it’s easy for Christians to think that we can influence in our flesh, and neglect the power of prayer. (“Not by might, nor by power, but by my Spirit, saith the Lord of hosts.” Zech 4:6) If we believe Proverbs 21:1, then our first response should be prayer. That should further inform how we communicate. Let us not allow the fear of the world’s power to shake our faith. We know the God of the universe Who’s ultimately in charge. So then, our most powerful gospel-centered influence is through prayer, to influence the power of God, to work on the hearts of powerful people. Many civil government leaders don’t see churches as being beneficial to society as a whole. Local churches need to change this perception. As local leaders often move to higher offices, it behooves local churches to impact these local leaders with gospel-centered influence early in their public service. If followers of Christ are purposeful about the practical steps of gospel-centered influence at the local levels, leaders’ perception of our churches can shift entirely. Simply start by making prayer for leaders a priority in your church. Follow up your prayers by finding out the prayer needs of your local government officials. As you pray for them, God will give you a heart to love them. Find out how you can pray for them and minister to them. Attend a city hall meeting to pray and learn about the needs in your community. Reach out to your local city and county officials and find out how you can honor them and pray for them. Put action to your prayers - follow up, meet needs, serve unconditionally. Action should not inspire prayer. Prayer should inspire action. This plan for gospel-centered influence has the chance to change a nation and indeed the world! It all starts with making prayer a priority in our personal and corporate prayer times. Will you join the paradigm shift from politics to prayer, practice and perception, and thus impact your city, state, nation, and world with the gifts of prayer and pastoral care? Rick Jackson stood in halls of Congress with his daughter when he spotted his congressman strolling down the corridor. "Look! There's Mark Sanford," Jackson thought he whispered to his daughter. "You looking for me?" said Sanford, who was now standing in front of him. At first, Jackson said he stumbled over his words, trying to pick the right ones. But finally the Wadmalaw Island resident told Sanford why they were there: It was a senior trip for his daughter, and they were there to pray for their leaders. At that mention, Sanford ushered them into the congressional elevator. When they got to Sanford's office, the Republican offered Jackson's daughter a cookie. The three posed for a picture. Then, Sanford turned to Jackson. "You know what I've been through. You know the issues," he said. "Would you pray for me?" With his permission, Jackson laid his hands on the former governor of South Carolina and prayed. It didn't matter that Jackson had worked for the campaign of Curtis Bostic, the former Charleston County Councilman who faced off against Sanford in a 2013 GOP primary. Prayer, Jackson said, is not a partisan act. Soon, they were all in tears. "It was the sweetest moment and, as a leader, he needed it. Life is tough, but it's tougher for them," said Jackson, recalling that moment two years ago. "To encourage a man who many thought one day could have been president, is still a man in need." It's the reason why Jackson has been praying daily for three politicians from somewhere in America on a rotating basis for nearly a decade with the help of a 13-year-old nonprofit called Public Servants Prayer. The 58-year-old gets a daily email reminding him who to pray for in South Carolina. Though Public Servants Prayer is based out of Indiana, its founder Matt Barnes said its mission was born in Charleston. During a family trip in 2004, Barnes attended a service at Victory Baptist Church on James Island. During the service, the pastor preached on 1 Timothy 2:1-4, which talks about the importance of praying for leaders. Hearing that scripture, Barnes realized praying for politicians would be a great idea for a ministry. "As you may tell by the headlines there are many temptations to do wrong," Barnes said. "Leadership by definition is lonely. The higher you get to the top the less friends you have. It’s important for believers to be praying for their leaders." Initially, Barnes set up a website that named three lawmakers from Indiana differently each day and encouraged people to pray for them. It grew from there. Now, in addition to daily emails, the organization has a social media manager that runs Twitter accounts in all 50 states. And each day, the accounts tweet the three politicians to pray for in each state. "Across all 50 states, we have more than 30,000 Twitter followers combined, and our tweets are retweeted by about 1 million people a day," Barnes said. "It's a way, in the modern age, for lawmakers to get a notification that they are being prayed for today." To be fair, Public Servants Prayer goes in alphabetical order when picking leaders to pray for on a given day. Given today's partisan divisions, Barnes said these small acts of prayer are needed now more than ever. "Party and issues are not what our focus is. Our focus is on the people," he said, "and politicians are people." For Jackson, it is also a humbling experience to lift the names of his lawmakers up in prayer. "You're sitting there and caring, not railing not accusing," Jackson said. "Wouldn't life be better if we all did that a little more?" In this Issue: Chaplain Brings Civility to the Statehouse, A Letter from Vice President Mike Pence, 2018 Women's Statehouse Day, The Continued Impact of Twitter, and New Growth Begins to Take Shape! When they are lonely, You are a Friend that sticks closer than a brother. When they have a problem or difficulty, You are the Giver of wisdom. When they are wounded in heart, You are the Balm in Gilead. When they are physically ill, You are the Great Physician. When they are discouraged, You can give them hope. When they are tempted and tried, You provide a way of escape. When the weight of the office is more than they can bear, You are the burden bearer. When the demands surround them, You can give sufficient grace and strength. Father, please provide rest for their body, relief for their soul, and refreshment for their spirit. There is a time for partisan debates. There is a time for bipartisan prayer. The recent shooting on a baseball field outside D.C. reminds us of the need for bipartisan prayer. Sunday, July 2, was a time our local congregation focused on prayer for elected officials. I’ll explain who we invited, what we did, and how it can be done again. Then I’ll urge biblical theology and a ready application. First, who we invited. Rev. Matthew Barnes serves as volunteer chaplain to the Indiana Statehouse. He leads Bible studies as an encouragement to representatives. He leads events reminding believing citizens to pray for their elected officials. Barnes exhorts, “It’s hard to objectify elected officials that you actually pray for.” 1 Timothy 2:1-4, and other biblical data, urges the believing citizen to honor the governing authorities and honoring includes prayer. The Bible does not make the ability to have convictions antithetical to the ability to have compassion for elected officials (even the ones who might not share your convictions). There is a time for debate and a time for prayer. We invited twenty-one of our elected representatives to our morning worship on July 2. Among the aspects to our worship that day, we mentioned by name the ones we invited—some of which were able to join us. Second, what we did. We not only prayed for certain elected officials by name but we also offered resources. Our members were able to receive a bookmark for a month of prayer, “31 attributes to pray for leaders.” This bookmark is made available for free by the ministry Matthew Barnes oversees: www.publicservantsprayer.org . Rev. Barnes delivered an exposition of 1 Timothy 2:1-4. He used an acronym TIPS for prayer: Thanksgiving, Intercessions, Prayer requests, and Supplications in earnest. In Barnes’ usual easy-to-listen-to-style, he conveyed a penetrating exhortation: treat your elected officials like real people with real needs. This is what we did and will do, I hope. Third, how it can be done again. This prayer event is not a parochial one for a couple churches. Rev. Barnes is quite willing to support and receive support from new partner churches. We have been supporting public servants prayer for some years now as part of our missions. If you would like more information on supporting this ministry, after you view online, feel free to reach out. Having recently spoken with Matthew at length, and heard his heart for our great state, I’m quite sure Rev. Barnes would be glad to consider invitations to share at your church. Corporate prayer events like this can be done again and again. Fourth, you need a biblical theology on these matters. Convictions should collide; however, convictions and compassion are not biblically antithetical. Convictions and compassion intersect, for the believer, during times of prayer. Because we live in a fallen world, you and I need reminders to do what we are supposed to do. This is where the Bible informs our actions through prayer. A whole biblical theology of church/state relations will yield results in the life of the believer. The Christian will hear from Peter and Paul and Jesus himself about how we are to honor the governing authorities (1 Peter 2), pray for them (Romans 13:1-7, 1 Timothy 2:1-4), and even pay taxes (Matthew 22). A whole biblical theology will lead the Christian into giving honor where honor is due while not violating conscience. I am not advocating this is easy but it is a command of God. This intersection of conviction and compassion is doable. Fifth, and finally, a ready application. Governing authorities are elected by the people for the people and necessarily must hear from the people—so you need to be saying some thing to your elected officials. But the answer to our civility issues will not come simply by saying, but also by praying, for our elected officials. Inspired? Then go to publicservantsprayer.org and click on ‘receive prayer requests’ weekly. They only ask for your name and email address. Can you commit to praying weekly? Will you join the prayer club? The following is an article that was written by NPR affiliate newsworks.com in New Jersey. The writer conveys the heart of Public Servants' Prayer quite well. The Bible verses that caught his attention were 1 Timothy 2:1-2: "I exhort therefore, that, first of all, supplications, prayers, intercessions, and giving of thanks, be made for all men; For kings, and for all that are in authority; that we may lead a quiet and peaceable life in all godliness and honesty." "I thought that would be a neat idea for a ministry," said Barnes, "because many folks, citizens across the United States, don't even know their legislators' names, much less what they care about." Thus was born Public Servants' Prayer, initially a website that named three senators, representatives, or state politicians from Indiana each day and encouraged people to pray for them. Barnes, a volunteer chaplain at the Indiana Statehouse, decided after a while to expand Public Servants' Prayer nationally, and hired a firm that specialized in political data to supply him with information about the more than 8,000 members of Congress and state legislators. Barnes hopes the project will help with what he calls the country's "civility problem." "The neat thing about prayer is that, as someone begins to pray for someone, it's impossible to hate someone you're earnestly praying for. You end up loving them," he said. "That's my hope, my prayer, is that as people begin to pray, that their hearts begin to be softened towards people who don't think like them." Gusciora said he hopes the faithful pray "that I do the right thing and that we make sure we take care of the people who most need it, especially in times during the holidays. "I think it is important to think about helping others, and this fits in with that," he said. Here is our recent postcard handout. If you would like to print it out, click here for a PDF file. 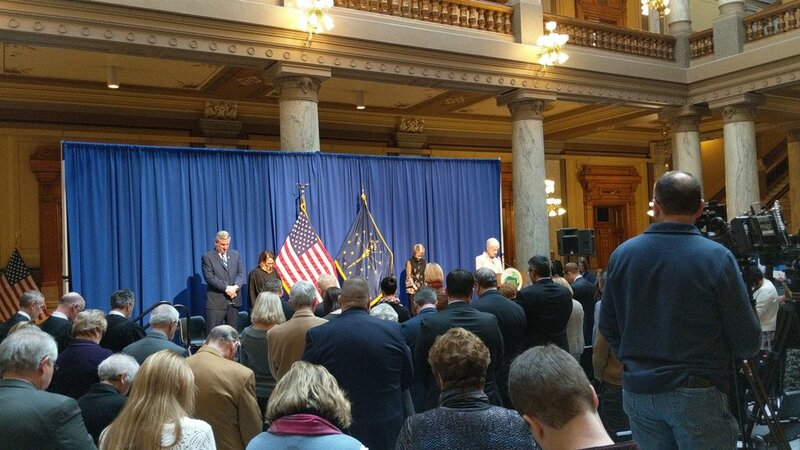 I have been ministering in the Indiana Statehouse for more than 10 years. God has opened more doors than I would have ever imagined, and it all started with God impressing on my heart to pray for leaders. I found that it is impossible to hate someone for whom you earnestly pray. I can honestly say that I love politicians! Politicians are simply people who hurt, feel and bleed the same as you and I. Some of them know Christ, others do not. The political arena has a vacuum of pastoral care. Many people want to influence politics and politicians. Every time there is a perceived political loss for people of faith, there are passionate calls for pastors and churches to engage. This is true of churches on all sides of the political spectrum. However, influence takes time and integrity. Let people know you care about them, and they are more likely to listen. Earn the right to be heard. In 1 Peter 2:12-17, God gives us a path to sharing the Gospel with leaders. "Conversation" in this verse refers to how we talk and conduct ourselves, or our behavior. We are to be a benefit to our communities and society at large. "Among the Gentiles" calls attention to unbelievers. "The day of visitation" can have several applications, from civil leaders visiting a church, to Judgement Day. Matthew Henry and John Gill indicate that "the day of visitation" likely refers to when God visits a soul to draw them to Himself. Verses 13-14 admonish the believer to submit to civil government. Verse 15 reconnects the unbelieving leaders mentioned in verses 13-14, back to verse 12. The will of God is that while you are submitting to authority and doing good works, you are stopping the mouths of those who speak ill of you. If your local government sees your ministry and appreciates the efforts, God can use it to draw their hearts to Him. So how do we engage these leaders who think badly of the people of God? Here is a three-fold mission plan that is both biblical and practical. 1) PRAY - Although it may seem to lack the flashy appeal that comes with political action, it is the biblical believer’s mandate found in 1 Timothy 2:1-4. Prayer is the most powerful action you can perform. Why settle for twisting the arm of a political leader when we know the One who holds their heart in His hands? (Proverbs 21:1) While it is indeed vital to have Christians serving in the public sphere, prayer should lead to action, not vice versa. Our team has spent countless hours and resources to develop a free tool to assist you in systematically praying for all of your state and federal legislators. You can find it at www.publicservantsprayer.org. Sign up for a daily or weekly email, follow us on Twitter, or like us on Facebook from your state page on the website. 2) HONOR - “I respect the office, but not the officeholder.” Is this biblical reasoning? First Peter 2:17 states, "Honor all men. Love the brotherhood. Fear God. Honor the king." It appears we are to honor both the person and the position. We do not have to agreewith their actions to honor and love them. It is difficult to influence someone without first honoring them. 3) SERVE - Peter encouraged the people of God to let civil government leaders see their good works, which will bring God glory. Serving communities by helping the widows, fatherless, poor, needy, and elderly actually directs people to Jesus. This is not advocating for a works-based gospel, but merely pointing out that believers are saved to good works. (See Ephesians 2:10, Matthew 5:16) Be aware that government leaders see straight through a façade and often presume (rightly so) that everyone wants something from them. View the political arena as a mission field. Serve with authenticity, sincerity and integrity. Steer clear of ulterior motives and hidden agendas. All states have local governments. Indiana has 10,746 elected leaders. There are 92 counties with courthouses, scores of cities and towns, numerous school boards, elected sheriffs, judges, township trustees, etc. The doors to government meetings are open to the public. Go to the various bodies of government and silently pray while public meetings are being held. If you want to know where a community needs ministry, listen to elected leaders. They have their finger on the pulse of the problem areas. There is a local unit of government quite near you and your church. If you need help finding when your local government meets, our team can help. We are even willing to assist you by attending meetings with you or making introductions with leaders. We may be surprised what God will do with this initiative. As you begin to pray specifically for your leaders and their requests, your church may find ways to assist local civil government. Your church may already do many things to benefit your local community. This is wonderful, but a key piece of 1 Peter 2:12 says that the leaders will "behold" the good works. We don't have to trumpet our good deeds, but we can let local leaders know what we are doing and ask how we can be more effective. Use this simple mission statement to guide you - I will PRAY, I will HONOR my leaders, I will SERVE my community. Access is granted. Influence is earned. Hello from the great capitol city of Indiana! This is the first of many letters we hope to write sharing what God is doing through The Public Servant’s Prayer Ministry. Some of you may already know the burden that God has laid on my heart, but for those of you who do not, here’s a brief synopsis. In late October of 2004, God impressed upon my heart 1 Timothy 2:1-2. I had desired for many years to be ministering full-time, but God had not opened any doors until then. After a month of prayer, consideration, and counsel, God made it clear that I was to leave my full-time job and start a ministry of prayer to the public servants across Indiana. The ministry has a dual purpose:(1) To minister to and gather the specific prayer requests from the legislators of Indiana, (2) To encourage local churches to get directly involved in praying for their community leaders. My family and I arrived in Indianapolis on Jan 3, and the legislative session began the 4th. God has opened many doors in the short time we have been here. I am now scheduling speakers, leading the music, and my wife plays the piano for the weekly chapel services here in the Statehouse. The chapel services have been in existence for more than forty years so we consider it a great honor to be asked to fill these roles. I have also been invited to attend the weekly Legislator’s Bible Study. I have been greatly encouraged to meet some solid, godly, leaders here in our state government. One of my biggest supporters has been Senator Dennis Kruse. He has introduced me to several people as the chaplain of the general assembly and has given me many great ideas on how to further the ministry. Obviously it will take a long time to establish relationships with all 150 legislators, but I am thankful for the ones that have welcomed me so readily into their midst. I am currently looking for churches across the state that have a desire to pray for their state representative and senator. I would love to come and speak to your church and share the burden God has laid on my heart. My vision and goal is to see several churches in each district across the state praying for and corresponding with their legislators. Let me give you an example of the power of ONE voice. Senator Sue Landske stated to me she has ONE church that sends her a card just ONCE a year thanking her for her work and letting her know they are praying for her. They have made a profound impression on her and she updates them on the general assembly. The astounding thing is that church is not even in her district. What an impact we as Christians could make with a little effort! God has already answered many prayers and provided in incredible ways for us. We have a wonderful place to stay while we are in Indianapolis four to five days every week. We were given a top-of-the-line lap top and the money to buy a printer. My wardrobe changed considerably in this new job and I received many gifts of clothing that have helped me be dressed properly. Even down to the smallest details, God provides for his people! Thank you all for your part in praying for and supporting us! (10)Rep. Cindy Noe (dist. 87, Indianapolis) transition of leadership from dem. to rep. Please pray for our family, that God would give us flexibility in this life-changing work, but also help us to develop a schedule that works for us. Miriam asks for prayer for patience with the children and the changes. Also, please pray for me, for boldness and that God would continue to open doors and grant favor with our legislators. Thank you for being a part of the work God has called us to!